Day 3, 4, 5 & 6! Who forgets to take pictures of food these days?? Well.. ME. It seems that we are inundated with food pictures on a daily basis right? I forgot to take a pic of dinner for day 5. It was just whole wheat pasta with pesto sauce with spinach and salad, so you can picture that easily enough. 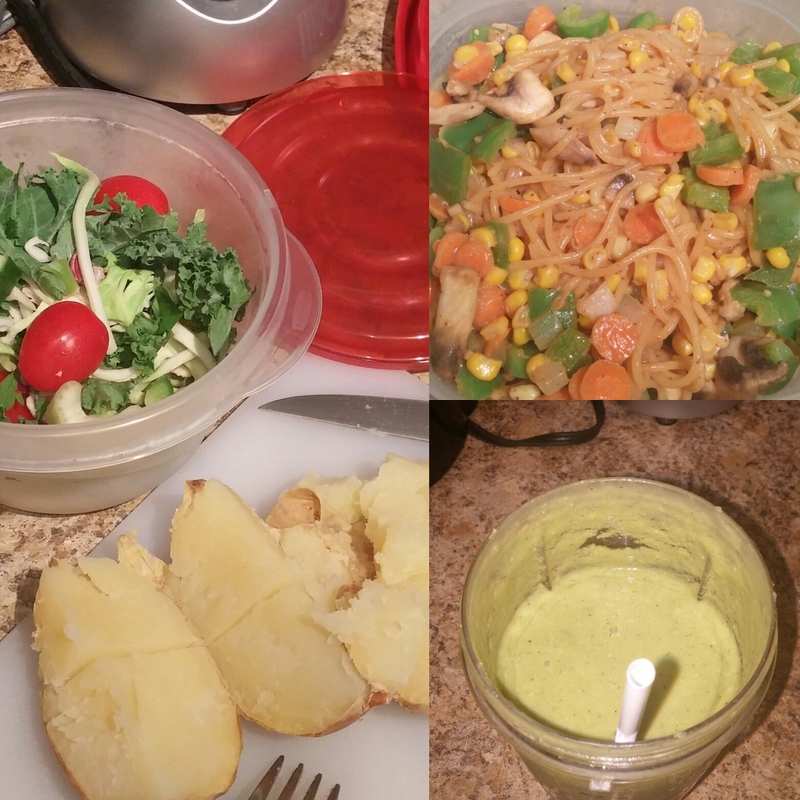 Anyways I am on the last day of the 7 Day Diet Plan by Katherine Kyle at Green Thickies and I have to say I definitely didn’t lose weight but my gut health is better and my cravings were absolutely manageable I had no problem ignoring junk food which is hard when you work evening shifts and don’t go to bed 5-6 hours after dinner. Down side though I did have a cheat night last night because my friend had a dinner night planned and we were suppose to go to Sammy J Peppers. My friend couldn’t make it and SP decided to make it a date night. I just had to say yes because date night has been so so rare lately. I think I’ll try and do a light detox in a couple of weeks since I feel guilty having a cheat night. I just hate it when I don’t stick to something because I chastise myself after the fact. DAY 3:Apple Coconut Green Thickie, Salad w Asian dressing & Mushroom & White Bean Chilli w Brown rice. For day 6 I was lazy to bake a potato so I added some hummus in addition to my fillings for my salad. It was tough to finish. SO filling! I didn’t eat all of my dinner it was way too much pasta though I did eat all the seafood! Time after time I’ve chastised myself on not prepping my food ahead of time. For me this is a major cause of grabbing convenient unhealthy stuff when I’m hungry. For this little diet I’m doing, there were some things I could do to help reduce food preparation time. These items could keep for a few so I wasn’t worried, plus I could always freeze it if I had excess. Salad enough for 5 servings, Date Paste made from scratch and an oil free Hummus. The date paste recipe came from Green Thickies and the recipe for the hummus came from Carrie On Living. Tomorrow I will post and update on day 3 & 4. So far I am not sure if I have lost any weight but oh well at least I feel good and thats important as well. Laterz. Hi! So as I mentioned in an earlier post I was going to start the Green Thickie 7 day diet plan by Katherine Kyle at Green Thickies. Day 1 and day 2 are in the bag and I must say it has not been as difficult as I though it might be. I did get a bit hungry before dinner on day 1 and SP offered me pork chops and corn for dinner. Proud to say I turned it down in favour of keeping up with my resolution. I will post some pictures of what I had but won’t be providing any recipes as it’s copyrighted and I paid for it etc. But you will get the gist of what I’m feeding my body. For mid afternoon snacks it’s some nuts and a small fruit but what you see here is pretty much all I ate otherwise. I did find eating my full dinner a little difficult as the portion was big for me but I gobbled it down as it’s mostly veggies. It keeps me satiated and satisfied and I’m able to turn down sweets and desserts. FYI it takes me a while to finish my smoothie as it’s so filling. For Day 1 I had the same salad with a sweet potato. I am suppose to have a salad with my dinner but I just could not stomach it I was too full. So far so good. Though I found out I am not a big fan of citrus smoothies when I have mylk or any extra goodies (oats, seeds, nuts etc.) mixed in. I prefer my citrus smoothies with water and berries. Will be back with more updates! Laterz..